Sweet potatoes – the bright orange-fleshed type – are one of my favorite vegetables to cook with, both for their stunning color and for their high nutrient density. The recipe below pairs sweet roasted sweet potatoes with protein- and fiber-full chickpeas in a grain-free Buddha bowl that is sure to satisfy any appetite. 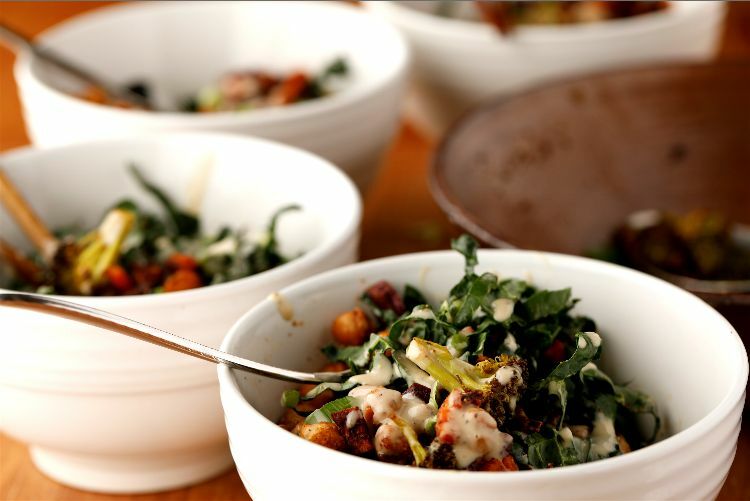 Ribbons of kale form the base of this healthy meal-in-a-bowl. The sweet potato provides plenty of starchy goodness to make it filling, but if you want to add grains, a couple spoonfuls of cooked brown rice, farro, quinoa or wheatberries would all do the trick nicely. Preheat the oven to 425 degrees F. Line a large, rimmed baking sheet with aluminum foil or parchment paper. In a small bowl, mix together the olive oil, chili powder, cumin, oregano, salt and pepper. In a medium bowl, toss the sweet potato with one-third of the oil and spice mixture. Arrange the sweet potato on the baking sheet in a single layer. Add the broccoli to the bowl and toss with half of the remaining oil mixture. Arrange the broccoli on the baking sheet next to the sweet potatoes. Add the chickpeas to the bowl and toss with the remaining oil mixture and arrange them on the baking sheet next to the broccoli. Roast in the preheated oven, stirring once after about 15 minutes, until the vegetables are browned and the sweet potatoes are tender, about 30 minutes. Meanwhile, make the dressing. In the bowl you used to toss the vegetables, combine the tahini, lemon juice, syrup, vinegar, salt and pepper and stir to mix well. If the dressing is too thick, start by adding 2 tablespoons of water and mix to incorporate. If the dressing is still too thick, add 1 teaspoon of water at a time until desired consistency has been reached. 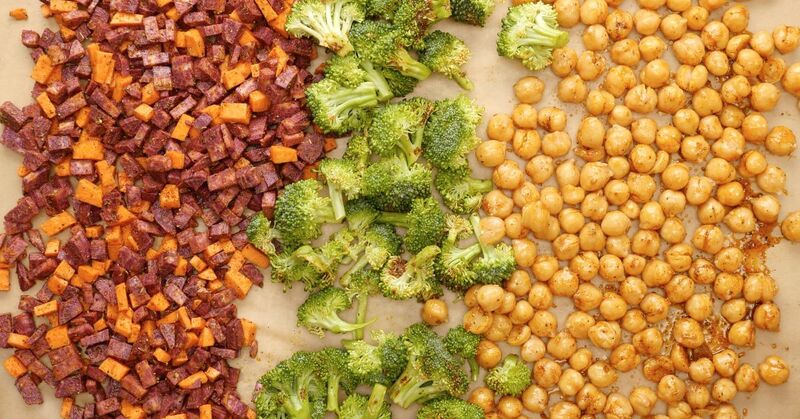 To serve, spoon the sweet potato, broccoli and chickpeas, into four serving bowls. Arrange the kale on top before drizzling the sauce over the top, garnishing with scallions.